Bluetooth is a good thing because… Unlike Apple AirPlay, it enables almost any portable device or computer to work with a wider range of speakers and other products. Bluetooth is a bad thing because… Exactly that universality means there’s been a massive onslaught of plasticky wireless speakers, most of which seems to have been designed with looks rather than performance as a priority, and apparently with the cheapest of audio components inside. They’re not even ‘fi’, let alone ‘hi’, and yet they sell by the truckload, at a stroke limiting the audio expectations of those buying them and tarring with the same brush of mediocrity those wireless speaker systems and other Bluetooth devices actually making an effort to deliver high-quality audio. You see, there’s nothing actually wrong with Bluetooth. Of late I’ve been spending quite a lot of time at my home office desk listening to music while writing, and that’s given me the chance to explore quite a variety of Bluetooth audio devices, from the excellent Arcam rBlink to the similarly impressive Focal Easya speaker system. The conclusion? Bluetooth can sound excellent, especially if you’re lucky enough to have both a source and audio device using the higher-performance aptX variant of the wireless system. 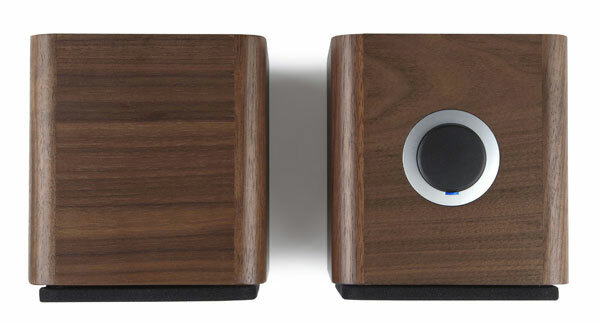 A case in point is the very fine Ruark Audio MR1 speaker system: not only is it quite a looker, in the usual smooth Ruark style – it comes in a choice of walnut veneer or soft black or white lacquers –, it’s also beautifully simple to use and sounds excellent, too. 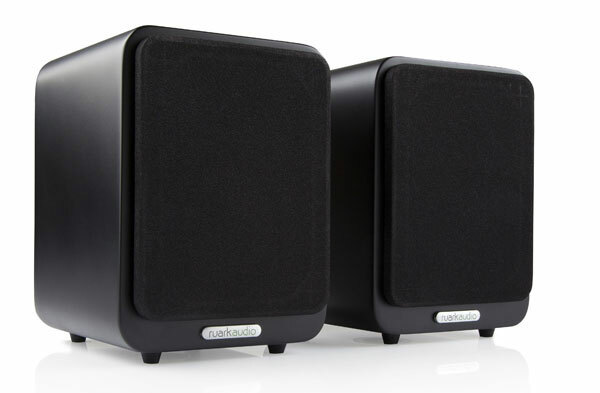 Selling for £300, it comprises a pair of 17cm-tall powered speakers: the amplification is in the right speaker, and the controls are simplified to a single twist and push device plus a tiny remote handset. 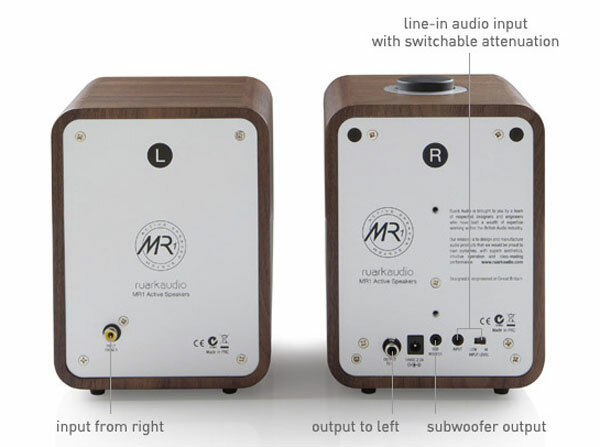 The drivers are Ruark’s own 20mm soft-dome tweeter and a long-throw 7.5cm woofer tuned with a downward-venting port, each using a neodymium magnet system, while the amplification in the master speaker is a Class AB design, delivering 20W, with the left speaker connected using a cable supplied. This uses phono sockets, so it would be easy to add a longer cable should the already generous length provided prove insufficient. As well as the aptX Bluetooth there’s a 3.5mm line input, an output for an external subwoofer and even the ability to be used with Ruark’s £50 BackPack rechargeable battery pack should you wish to listen without mains power. One press of the control atop the master speaker powers it up and shows an orange light, indicating the line input is selected. Press again for a couple of seconds, or press the Bluetooth button on the remote, and the MR1 is now ‘discoverable’, and can be paired with your computer, smartphone, tablet or whatever. Up eight devices can be paired in this way. The Ruark sound is instantly appealing: warm and rich, but with good detail and sparkle when playing decent recordings, it can also flatter low-bitrate Internet radio content. There’s no shortage of bass: in fact for desktop listening the low-end is perhaps a little over-generous, although this can be corrected using the equaliser settings in any Bluetooth device to which it’s connected. However, that’s preferable to thinness or lack of low-end, and there’s never any danger of the tonality swamping the midband and treble, even when well off the vertical axis of the tweeters – as, for example, with the speakers on a desk. Only were you to want to use the Ruark as a main speaker system, listening from a greater distance, might a subwoofer be worth considering – and even then such a move is probably of debatable wisdom, so well do these little speakers fill a space with sound. The Ruark Audio MR1 is not a just a fine example of how good Bluetooth can sound, but also an all-in-one solution with both convenience and style..